The Journey consists of 5 interactive sessions. Each Session lasts between 1-2 hrs and can be carried out with individuals, families or groups. The facilitator will guide participants through the activities. 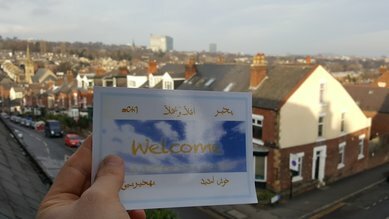 Each participant is given session notes in their own language to help them engage with the content. Corresponding audio recordings are also available for participants who have limited literacy. Trauma can effect people in a number of ways and many people naturally struggle for sometime afterwards. It is often hard for people to talk about what they are going through and many often assume no one else can relate to their experience. This situation can be very frightening and lonely. Session 1 aims to help normalise some of the usual symptoms of trauma that participants may be experiencing. 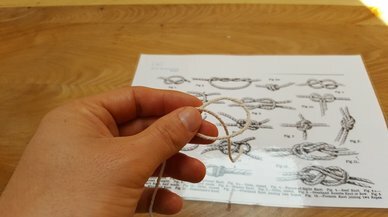 Using the illustration of a knot in a piece of string, trauma symptoms are presented as the normal and expected outcome of the journey the participant has been through. They are invited to tie knots in their string while hearing about the different symptoms that can result from trauma. They are then invited to untie the knots, one by one, noting that sometimes knots comes loose naturally and at other times untying them can be challenging and may require help. When trapped in an undesirable situation it is easy to focus on the negative and to see yourself as a victim. This can make people feel powerless. Feeling powerless is detrimental to mental health and emotional wellbeing. It increases stress and anxiety, sapping motivation and resilience. Session 2 aims to help participants identify where their strength is. They are given a paper cup and asked to write or draw on it the different things that have helped them to survive. This includes personal characteristics, relationships and activities. 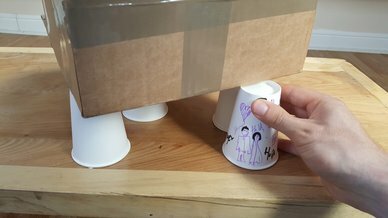 They then slide their cup under a box that is supported by other cups. Their cup now forms one of the pillars holding the box up. This demonstrates that the factors they have written will continue to support them, and at the same time they can help to support others. This station aims to build self-esteem and encourages a proactive mindset to engage with the present situation. ​When people have been through painful and traumatic events, coming to terms with what has happened can be a challenging process. Session 3 aims to facilitate remembrance, helping participants to process the dramatic transition they have experienced in a healthy way. Participants take three pebbles representing memories of pain, loss and thankfulness. They write or draw a representation of the specific memories on each pebble. The facilitator explains it is good for them to carry the stones for a while, but there also comes a time to lay them down. While they carry the stones the past may remain a burden, but as they lay the pebbles down that burden can become a foundation on which to build for the future. 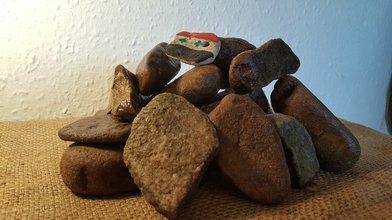 The facilitator then sensitively invites them to lay their pebbles on a pile of other stones. They are told that this is an altar; a place of mourning, of thankfulness and of hope, marking the end of one season and the beginning of another. The future many refugees hope for seems unattainable, while the past seems lost. Many feel they are stuck in limbo, living in difficult conditions, trapped in places they hoped to be able to pass through, or waiting for unknown lengths of time for legal status to be granted allowing them to start to build a life. Many are hesitant to do anything in the meantime. It often does not seem worthwhile. In session 4 participants are encouraged about the value of focussing on improving their present circumstance in the small ways they are able. They are presented with two pictures of toy houses and a small box of plastic bricks. 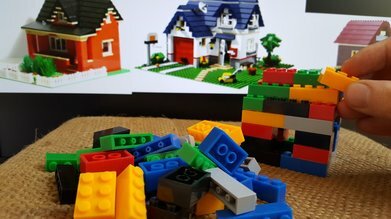 There are not enough bricks to build either house, but the bricks they do have can build a smaller structure. It may not be all they lost or even all they hope for, but in building at all, even with the limited number of bricks available, they are improving their situation. This station aims to manage participants' expectations and encourages them to focus on what is achievable in the present rather than just dwelling on the past or waiting for the future. ​Many refugees can feel forgotten by the world. Many feel that everything is against them and no one is on their side. The transition from leaving their homeland to finding a new home can be very lonely. Session 5 aims to facilitate connection between refugees and those in their new community or around the world who want to communicate solidarity. Each participant receives a card containing a personal message from someone saying they are thinking of them and standing with them. The participants are then invited to write their own card for someone going through the Journey in the future.